Buildings alongside one of the canals in the beautiful Belgian city of Bruges. 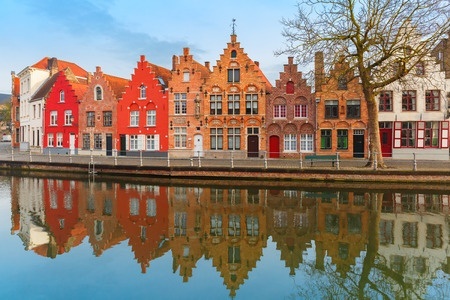 Known locally as Brugge (it’s in the Dutch-speaking northern half of Belgium), Bruges is the capital of West Flanders and was historically one of Belgium’s most important commercial centres. It’s still a major Belgian port (thanks to its link with Zeebrugge, which translates loosely as Bruges-on-Sea), but is now far better known as a tourist destination. Its picturesque town centre is a UNESCO World Heritage Site that features heavily in the film In Bruges starring Colin Farrell, Brendan Gleeson and Ralph Fiennes, which is well worth a watch if you’re into bizarre and sometimes violent black comedy. This entry was posted	on Saturday 31 January 2015 at 14:13	and is filed under 2015, Belgium. You can follow any responses to this entry through the RSS 2.0 feed. You can leave a response, or trackback from your own site.